Be the first to share your favorite memory, photo or story of Clara "Linda" . This memorial page is dedicated for family, friends and future generations to celebrate the life of their loved one. 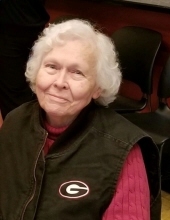 Clara “Linda” Grogan Wilkes, 78, passed away Monday, November 19, 2018, with her husband, Ed, by her side. Linda was born on September 3, 1940 to the late Robert and Queenie (Morgan) Grogan in Cedartown, GA. On September 16, 1961, she married William Edward Wilkes in Cedartown, GA.
For many years Linda drove a school bus in Cedartown, where she retired from the Polk School District. She cherished having all the kids on the bus and enjoyed taking care of them as her own. In her free time, she took great joy tending to her garden and sewing. Most of all she enjoyed cooking and hosting family get-togethers, and always made sure everyone was well fed. Linda took great comfort in her faith in God and enjoyed going to the Baptist church on Sundays. She is survived by her husband, Ed of Wausau; daughters, Toni (Nolan) Stoner of Tavares, FL and Lisa (Charles) Vasser of Elmwood; grandchildren, Leslie (Ivan) Mitchell of Wausau, Blake (Kara Black) Cain of Locust Grove, GA, and Jennifer (Jason Moore) Reece of Cartersville, GA; great-grandchildren, Cody and Taylor Bauer of Wausau, and Andrew Kalasz of Montague, MI; as well as several nieces and nephews. She was preceded in death by her parents; brothers, Donald, Max, Terry, Howard, and Lynn Grogan; and sisters, Patricia Collins and Zelah Queen. The family will bring her ashes home to Cedartown, GA, where burial will be at Polk Memory Gardens. The Smith & miller Funeral Home is honored to make this local announcement for the family of Mrs. Linda Wilkes. To send flowers or a remembrance gift to the family of Clara "Linda" Grogan Wilkes, please visit our Tribute Store. "Email Address" would like to share the life celebration of Clara "Linda" Grogan Wilkes. Click on the "link" to go to share a favorite memory or leave a condolence message for the family.